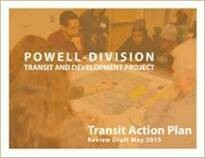 On June 1, 2015 the Powell-Division Transit and Development Steering Committee endorsed the Transit Action Plan, which supports moving into the project development phase, allowing us to answer routing and other questions with a greater level of design, while matching local to federal dollars. Now, Metro Council is expected to approve the Transit Action Plan moving thePowell-Division Transit and Development Project forward. As soon as 2020, the Powell-Division project could connect the region's first bus rapid transit line between downtown Portland and Mount Hood Community College in Gresham – passing right through the 82nd and Division intersection. Additionally, the council is expected to allocate $4.7 million in community planning and development grants to help cities and counties around the region develop concept and action plans for their communities. The grants are funded by an excise tax on most large construction projects in the region. Public comment will be heard at the beginning of the meeting.